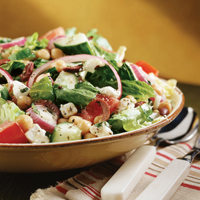 With a nod to the heart-healthy cuisine enjoyed by our Mediterranean friends, this robust salad is loaded with monounsaturated fats and fiber. In a large salad bowl, mix the oil, lemon juice, vinegar, oregano, and pepper with a fork. Add the tomatoes, chickpeas, cucumber, red onion, parsley, and olives. Toss to mix well. If you have time, let marinate for 15 minutes.